Reading group questions for Molly McGrann's clever and unusual story about a daughter uncoving a family secret linked to a dilapidated brothel in post-war London, The Ladies of the House. Welcome to the all-new Picador Book Club. Each month we'll be suggesting a new or classic paperback that is perfect for book club discussion. 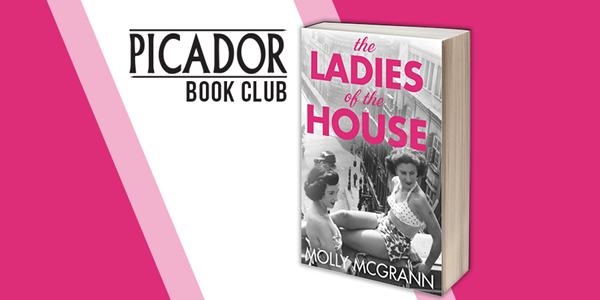 This month’s recommended novel for book clubs is Molly McGrann's clever and unusual story about a daughter uncovering a family secret linked to a dilapidated brothel in post-war London, The Ladies of the House. If you’d like to join the discussion about this month’s choice online, please use #PicadorBookClub. Marie's life is anything but exciting: she spends her days working at a linen shop and her evenings in front of the telly, eating biscuits with her mother. Until one day, a trip to the bank leads her to uncover her late father's deepest secret, and the truth about the other women in his life – Rita, the former beauty and 1940s good-time girl now on the lookout for husband number six; Annetta, whose dementia offers little respite from her painful past; and the charismatic Sal, who once presided over the ladies of the house and whose presence is still felt within its walls . . .
Start reading The Ladies of the House. What did you make of the relationship between Marie Gillies and her mother, Flavia? Do you think Marie should have told her mother what she discovered about Arthur’s past? What did you find most surprising about Arthur’s double life? The novel brings to life the world of Soho’s working girls in the 1950s. What were your impressions of Sal, Rita and Annetta, and of this time in London’s history? Love takes many forms in The Ladies of the House. Discuss the different types of love in the novel and how love – requited or otherwise – alters the course of the characters’ lives. To what extent did you feel the women in the novel were independent and to what extent did you feel they depended on or were controlled by men? Who or what do you think was ultimately the cause of the three deaths in Primrose Hill on that hot July day? Overall, did you find The Ladies of the House predominantly a comic or tragic novel? Would you recommend it to others? Take a look at our previous Picador Book Club choices here.